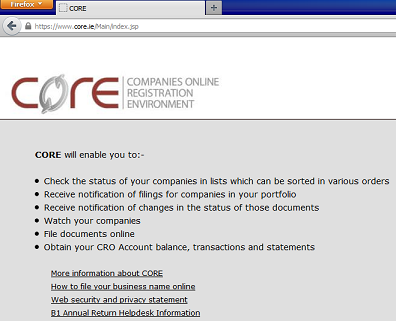 The Companies Online Registration Environment (CORE) operated by the Companies Office (CRO) will tomorrow move to a new web address: core.cro.ie. The old www.core.ie address will continue to work, but you will be automatically redirected to the new address. The CRO advise that, following the change, some users may receive warning messages from internet browsers, when they access previously bookmarked pages within CORE. Any such issues can be resolved by returning to http://www.core.ie, where you will be redirected to the new address core.cro.ie to login. File annual returns and other forms with the Companies Office. Manage your CRO account balance & transactions. In general, I find it an excellent system. If you own or manage a company, I recommend that you register for, and use it. The CRO eZine publicising this change is here. Next Post: What Will My Property Tax Return Look Like? If you are oone of the major problems faced by successful home business entrepreneurs is family members time. you need to do next.